Place in Chicago is the Billy Goat. What a way to write Jack the Crrbber. Tell it like it is! I have to say, I appreciate Alan's respect for the newspaper industry. It's more than I can say for the haters and self-appointed gurus like Jeff Jarvis. Come vote on my poll. How long will the online P-I survive? Nice to read a passionate (former) newspaper reporter’s writing. Maybe the P-I wouldn’t be closing if they had hired (or kept) more writers like you. However, a two newspaper town was a rare situation even before the Internet and this “great recession”. While I don’t have any first hand knowledge of the newspapers in Seattle, it’s been my experience that newspaper unions (except maybe the Guild) are mostly tone-deaf to their communities and the realities of the media landscape. RIP P-I and let’s hope it’s not too late to “save” the Seattle Times. I nearly accepted a job at the PI in 1998. Even back then, there were concerns that the JOA and competition from The Times would eventually end the PI's long-standing presence. I'm sad to see it go, too, but at least a few of us in the industry are actually surprised it has lasted this long. We are not the enemy for accepting a new delivery mechanism for news. The enemies are the complacent newspaper managements that failed to adapt to a changing industry - and they and their employees are suffering the consequences. The printed newspaper will die, and that's a good thing. Because the transition to online news wasn't managed well by incompetent newspaper managers, many good journalists will lose jobs, and that's a bad thing. But in the long run, news will survive, and be better for not having to pay for physical print production and distribution. Accept it, and be part of the change. Sure, the ink people have to change, but ink will not go away. I think that newspapers have to get away from the 'daily' notion (except for online news) and start publishing ink versions maybe 2 or 3 times a week, with those long long in depth and quality articles that we like to read at lunch, with our coffee, or on the weekend. Most important : hire really really good journalists that we can have faith in - the MOST important thing these days with all this information overload - what I am looking for, and am willing to PAY for, are highly qualified writers who know what they are talking about. Hey that is a rarity these days! 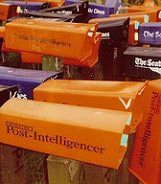 I lived in Seattle for many years (now in Paris where things are not much better for the news industry) and although I never agreed with the P-I's politics, I'll be sad to see them go. I *will* miss their Mariner coverage - anybody know if they're going to keep that up? All the best to the online team, hope it works! Nice post about the legacy of the P-I. It will be missed. Thanks for writing it. But you gotta wonder: Where today is a major metro paper with "a feisty anti-Establishment reputation"? So two questions: Have we lost 'em all? And does this have anything to do with the decline of journalism? Nice to hear your voice again, Jon. My dad and I used to savor your columns in the morning. "And I don’t want to sit in front of some damn terminal and click my way through copy bordered with blinking advertisements." Neither do I, but it's too tempting not to when it's all free online and, more importantly, when the tools for online news presentation and distribution are more powerful than anything newsprint has offered. I wish I had to pay for news, really -- or rather, I wish I had to pay for the reporting and insights of great journalists. But growing up with the Internet, I never knew what loyalty to a media organization meant; I only respected the concept. I've been studying journalism since high school in New Jersey, where I was just getting to know The (Bergen County) Record when newspapers started making their news available online for free, and I saw it all. I moved indiscriminately across news Web sites. None had my loyalty; none could hope to gain it. I had my favorite reporters and columnists, but I didn't have to peak at other parts of the papers (I did so only as a journalism student), and there was no need to care about or know who was paying these journalists (I cared only because I hoped to make a living doing the same thing). I've adopted the author's nostalgia for a world I never knew. Later, my friends joked about Googlezon, and it offended and scared me. I was naive. And, perhaps, so were people twice my age with all my foresight at the helms of the most powerful media companies. And that's what everyone talks about: let the media evolve with a better medium, stop killing trees, let go, your newsprint is staining my kitchen counter. But who's talking about the people in this enlightened future who won't have access to substantive news because computers, Internet connections and e-readers are still too expensive; and the local free public library can't afford to allow patrons more than an hour of computer time per day? The inexpensive distribution of news empowers everyone, and that in turn empowers our country. Is that line of social thinking partly at fault for how slowly traditional media have been moving to a medium still too expensive for too many? So quickly we forget the thousands who actually print the paper. Where is your concern for them? That's the problem with this country. We have never supported the people who live around us. If its cheaper for me to hell with you! I feel sorry for everyone losing their job. However you had to be blind not to see it happening in the newspaper industry. It started long before the internet. That is just the final nail! In the fifties almost every home had two newspapers delivered. Even when I delivered a newspaper in 1963 forty percent of my customers still got two papers. But in the 1980s - funny - during the last recession - it was the beginning of the end for newspapers. I watched circulation drop here at our local newspaper every single year for 20 years. Oh maybe a slight increase one year but never did any increase surpass numbers from the late 1970s. Never! As so many of you have pointed out, at least the trees will be safe! It's the sign of times, we need to see that this also comes with a generational shift -ouch! And yes who didnt like the (printed) newspapers and magazines at the kitchen and coffee shops, but maybe we need to ask, how do we strive in this new scenario? I am sure quality journalism is still needed. Think for this: It's only the printing in print media that's dying, new technologies more friendly and more efficient will continue to appear, and journalism will change along. If you want to see this facts as enemies, then I think, you have selected your role in this change. And yes many trees will be safer. We will find a way as the wolrd changes.